(c) Anup Shah/Nature Picture Library. A Mike Birkhead Associates film for BBC2’s Natural World series, showling how the failings of India’s £multi-million tiger conservation project are being ignored and obscured. Wildscreen Winner 2008 - Natural History Museum Award for the Environment. Battle to Save the Tiger won best conservation message at the International Wildlife Film Festival in Missoula. Nominated for 'Protection of Species' Award, 'Best Screenplay,' and 'Best Soundtrack,' at the Festival International du Film Animalier (FIFA). 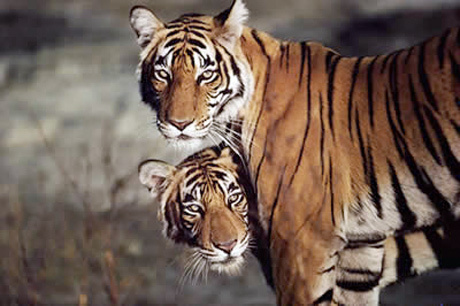 Bengal tigers are among the most charismatic creatures on Earth and a powerful emblem of India. A century ago, it’s estimated that 40,000 still roamed wild but then hunters with guns arrived, there was prestige in owning a tiger skin, people spread out into traditional tiger habitats and numbers plummeted. By 1972, conservationists were warning that only about 2,000 scattered tigers survived, making extinction almost inevitable. India and the world responded rapidly to the threat. Hunting was banned, the trade in skins and body parts outlawed and an internationally-backed rescue effort was started. For a time, the tigers flourished in the safe havens created by Project Tiger. Then, doubts began to be raised. Familiar tigers were disappearing, worrying quantities of pelts were being offered through illegal markets and respected scientists questioned the accuracy of tracking and counting methods. The evidence should have provoked a fresh campaign but it didn’t, so - why? BATTLE TO SAVE THE TIGER focuses on the findings of three champions of tiger conservation – Belinda Wright, an artist turned undercover skin-trade investigator; Valmik Thapar, a tiger expert and activist, and Raghu Chundawat a whistle-blowing scientist,. Their conclusion is that Project Tiger has consistently miscalculated and over-estimated wild tiger numbers, so that the total population is closer now to crisis than when the project was established, and that unchecked poaching probably means some premier reserves have no tigers at all. The film also shows how, instead of inspiring change, the trio’s quest for facts has brought them into conflict with the very officials tasked with safeguarding the species. Meanwhile, India’s tigers continue to be lost.